What Is Technical Analysis ( Charting )? What is Technical Analysis? What is charting? Technical Analysis is the study of past price and volume patterns in a security to better inform investing decisions. This study often involves plotting security prices over time on a chart (hence ‘charting’). Wall Street widely uses this form of analysis as a tool for decision making. It is a vast subject area with tomes written upon the subject, some even dating back hundreds of years. There are two parts to technical analysis - the what and the why. The 'what' are the patterns: what to look for, how to analyze a chart, and how to use it to make practical predictions about future price movement. The 'why' is what many people obsess over and is the least important to your trading. Why do these patterns repeat? The question is answered in many, often plausible ways, but the ‘why’ is impossible to prove. Charting is often dismissed as nonsense. Despite this, it's a dirty secret on Wall Street that everyone analyzes charts and the big trading banks pay for technical analysis departments. This article deals with the ‘why’ of technical analysis, and regardless of your thoughts on the subject, the Trade-A-Stock application can serve to objectively test those thoughts, allowing you to test technical analysis in an unbiased way. Ever been asked to predict the future? You are doing just that when you make an investment. And somehow, provided you did invest, you had enough certainty in your decision to put your money on the line. As you are now essentially a fortune teller, what kind of crystal ball will you use? The future is uncertain and our only real guide to the future is the past. In stocks, as in life, history tends to repeat itself. Analyzing price, effectively, can give you a small edge. The financial world is full of ways to essentially predict the future of securities, from looking at a price chart to assuming that over time the price goes up (buy and hold), to looking at a company’s predicted future sales. Technical analysis works as well or better than any single one of them. Price is all that matters. The only two numbers that determine profitability in any investment are the price at the entry and the price at the exit. Nothing else matters. In the case of a stock, how much money the company made, how great a business it is, etc., are completely inconsequential. It behooves an investor to at least look at the price. Fundamentals and Price Diverge - Frequently, Often, and Regularly. Fundamentals refer to the state of the company underlying the security - how much money it made, is projected to make, sales numbers, margins, etc. Often the fundamentals of the company are stable, unchanging, and easy to predict. However, these numbers often fail drastically, particularly over the short term (months), to correlate with price. In an age of information overload, what do you consider when making an investment. How do you weigh each piece of information, each piece of news? Price serves this function, simplifying and consolidating all new information about a stock, condensing it, and providing you with the variable that matters most. Technical Analysis tells you when to sell. Fundamental analysis strategies often disagree about what condition(s) dictate exiting your investments. Concepts like selling when stocks are ‘over-valued’ are extremely nebulous (like the valuation process), more so than recognizing patterns in a chart. We are told to ‘take profits’ at such times, but when precisely? ‘Buy and hold’, loosely translated as never selling, looses its appeal when thinking about companies that have gone bankrupt or ones that have fallen from a former glory never to recover. The information contained in price is completely honest, there is no confusing or misleading information, or outright lying ( in the case of shady accounting or pundits/analysts with dubious motives ). Misinformation abounds in fundamental pundit land, clouded by never-ending macro-economic discussions which are often a form of misdirection - events that only matter to the extent they effect your stock price. Price tells you what people (the ones who matter) are actually doing, as opposed to saying, or thinking, or might do in the future. The price charts are dispassionate and unbiased. Chances are that if you bought stock in a company, you have some sort of feeling or emotional bias about it. Perhaps you like their products? Likely you thought something like “its a good company”. 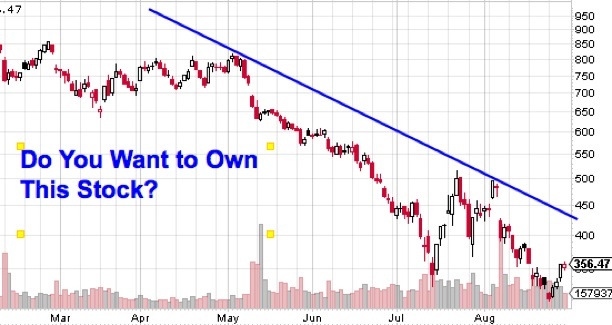 This kind of thinking can lead to irrational decisions, often to the detriment of your wealth, when the price action of a stock is giving a clear signal that market participants don’t like the company as much as you do. It reveals what the market is really thinking. Price and volume reveal the collective psychology of the people who drive the market. Are they bullish or bearish? Fearful or greedy? The charts can show you when this collective psychology changes. Collective psychology has a certain momentum, that often takes weeks to months to play out. Technical analysts can identify instances where the change will play out in a predictable manner and make trades accordingly with a high likelihood of success. 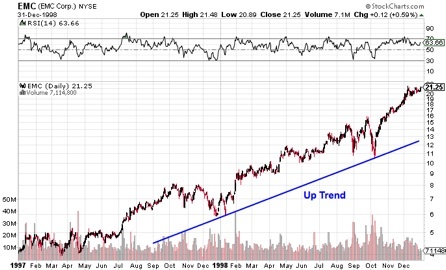 Ever looked at a chart of stock you owned that was plunging price? Each day you are loosing 2-3% of your investment. Day after day you watch your wealth evaporate. As a knowledgable investor you know that there is a good chance the stock’s price will rebound, but also as a knowledgeable investor you know that some stocks take years to reclaim their former glory and some never do. How did you feel? You are not alone, 9 out of 10 holders of that stock felt the same way. Price, all by itself, is a powerful force in decreasing demand. Its a kind of self-reinforcing feedback loop leading to powerful selling on behalf of shareholders. Economists cringe at statements like this, classical economic theory views price as a result of the forces of supply and demand. Classical economic theory also fails to explain market price behavior. The market is not rational, it is emotional, like the people who drive it. It is therefore predictable to the extent that human behavior is predictable. Security prices exhibit patterns. Trends and trading ranges and bubbles and busts abound in quantities not sufficiently explained by a ‘random-walk’ view of the stock market. In mathematical terms, prices exhibit statistical dependence, meaning that tomorrow’s price movement is not completely divorced from todays. The question is whether or not you can profit consistently from said dependence. The repetitive nature of price movements is attributed to market psychology. Market participants tend to react consistently to the same stimuli over time. Human nature is still the primary driver of the markets despite the increase in algorithmic trading. 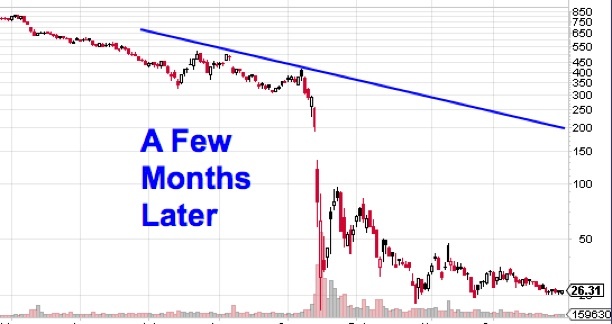 All of Wall Street is well-schooled in technical analysis and uses it routinely. If price patterns become sufficiently obvious to all market participants, they essentially become self-fulfilling prophecies as all traders act in concert when well-known patterns emerge. It’s already in the price. The market discounts everything. A major criticism of technical analysis is that it only considers price movement, ignoring the fundamental factors of the company. However, technical analysis assumes that, at any given time, a stock's price reflects everything that has or could affect the company - including fundamental factors. Technical analysts believe that the company's fundamentals, along with broader economic factors and market psychology, are all priced into the stock, removing the need to actually consider these factors separately. All information about stock and company ultimately gets reduced to price, thus any piece of information as well as its significance is reflected in the price action of the stock. If the company had a good earning report, it is reflected in the price. Was the CEO indicted for fraud? The price can tell you, or rather, the price can tell you whether it matters. The prices act as a sort of polling mechanism, the dollar weighted voting of all market participants. Crowd behavior is in some respects predictable - boom and bust cycles repeat themselves over and over again and show up clearly to the skilled technician. Everyone looks at a chart. Everyone. This means that even the most diehard fundamental investor is influenced by the price patterns they see, even if only at a subconscious level. The human brain is a pattern detection machine. It doesn’t turn off easily. It is possible, even likely, that the price action of a chart at some level influences even the most avid fundamental investor. One thing that drives patterns is institutional buying. When a large group of investors with money get behind a stock (think large money managers or hedge funds) that collective decision is reflected in the price and obvious to all who care to look. Furthermore that action and decision cannot be undone quickly due to the large amount of money and stock involved. It takes time for large institutions to build and exit positions as the amount of money they typically invest by necessity moves markets. These trends can be identified and exploited, particularly by the small investor. What are the limits of Technical Analysis? How is it misused? Detailed math formulas are used in technical analysis to produce indicators such as moving averages, volatility, Fibonacci wave patterns, etc. However, specific reliable guidelines are not always available to the individual who must interpret the indicators. Therefore it is possible that two individuals looking at the same set of charts could arrive at opposite conclusions. It is prone to misinterpretation. Finding a pattern in something as abstract as price series on a chart is often only in the eye of the beholder. It is very easy to ‘see’ something that isn’t really there. For this reason, it is best to keep the analysis as simple as possible. Like anything else, it requires practice and experience. You can rapidly gain this experience by using the free Trade-A-Stock application. Good technical analysis, at best, gives you simply an increased likelihood of certain price action in the future, but doesn’t guarantee it. It is comparable to the casino in blackjack. In every hand of blackjack the house has a statistical advantage, a certain likelihood of winning above that of the other players. However, the house can still lose. Technical Analysis can offer you an advantage slightly better than the house, an advantage that can lead to more profitable trading over time. It’s difficult to quantify and test. True. There is an inherent problem in testing the more arcane price patterns because the specific numerical definition of certain patterns is difficult to define mathematically or is subject to the user’s interpretation. Academics will tell you it’s voodoo. Anything that is an ‘art’ is inherently difficult to assess in a scientific way. 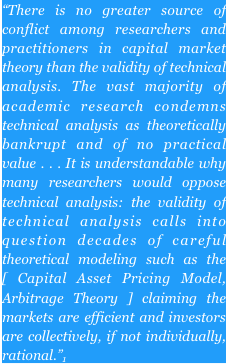 It equally difficult to prove the ‘why’ of technical analysis, even if one accepted its efficacy. It is such a vast subject with indicator upon indicator, that it is hard to even define precisely. The best way to prove its efficacy is to do so yourself by going to the Trade-A-Stock Application and putting it to the test. If you know nothing about technical analysis, try this article here for a very basic introduction. In order to trade, you must make a judgement about an uncertain future. Technical analysis can be one tool to aid the decision process. It doesn’t have to exist to the exclusion of all else. Given the artistic nature of it, the difficulty in quantifying it, the myriad strategies, the probabilistic nature of it, pattern transiency, etc., it is not unimaginable that academics, when putting the entire market as a whole to the test of technical analysis, do not see the small subset of patterns within the market which are exploitable. There is (or should be) an inner skeptic in all of us. We at NonRandomWalk.com are skeptical of certain aspects of technical analysis. Yet, we are traders as well; we’ve seen these patterns play out over and over. We’ve been disappointed, over and over, by the wealth depleting, wallet-draining results of fundamental analysis - analysis that is often accurate in all respects save for how it translates into price. Nothing is more frustrating than being right (about a stock’s fundamentals), but having the stock’s price reflect a different reality. It is this cynicism that led us to the creation of the Trade-A-Stock application. The free app lets you practice technical analysis-based trading on historical data without historical hindsight bias. This puts technical analysis to the test for the only person who really matters -- you. What Is Technical Analysis ( or Charting ) . . . . and Why Does It Work? 1. David Rode and Satu Parikh, “An Evolutionary Approach to Technical Trading and Capital Market Efficiency”. The Wharton School, University of Pennsylvania, May 1st, 1995.